Freckled Citizen: Friday I'm in Love! Awwww, remember this great series I used to do every single week, featuring my favorite little gems on the web? It's been a while, I know. This first weekend in June finds me alone in our pad (T's been traveling for work for a few days) until my parents drive up* this weekend to help me do some planting and patio maintenance. I see tomatoes in my future, and with any luck, healthy gardenia blossoms! But first, a fun dinner with one of my favorite DC ladies tonight. So in honor of the hot and muggy weekend ahead, I offer three great cool-down finds. Enjoy your weekend and stay cool, folks! I swear I cool off just looking at this blouse. I also love its dress up/dress down potential, maybe paired with some gorgeous stone jewelry my parents picked out for me in Tanzania? Yep, that'll do. These suckers are brilliant! I'm having one of those "why didn't I invent these?" feelings about this product. Such a great idea for beating the heat. ps: I got my act together last night and replenished by fun little Freckled Citizen Wants section last night. (Oh, the things we can do without a cute boy around the house to distract us!) It's been neglected too, mostly because posting photos of million-dollar rowhomes seemed a little excessive. So on a much smaller scale, see the bottom right sidebar or hop right over for some gift ideasfresh retail inspiration! *My parents are DRIVING UP. And I hopped down last weekend. And T hopped up to New York and Connecticut the other day. I continue to crush hard on my new geographic location. Ha! Those water bottle ice cube sticks were Andy's one addition to our wedding registry. We use them all the time. And that ice cream looks revolutionary. You sweet thing, thank you! I think my next endeavour is that caramel ice cream, but maybe with pecan sandies as a sandwich. I need to figure out how to make them chew. Will post soon! Hugs to you! The water bottle ice trays = pure genius. 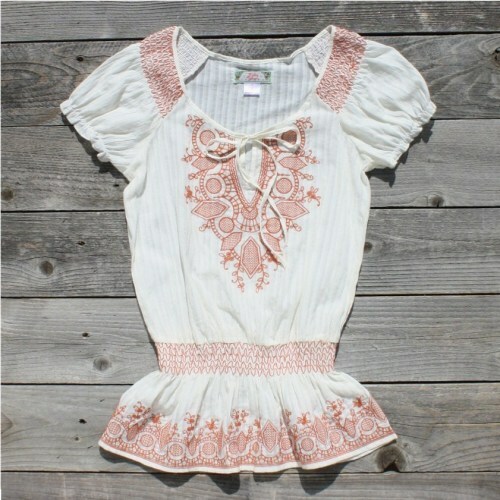 I need the Painted Rock blouse in dress form, because it's too darn hot for pants or shorts.